Joseph Barrow Montefiore #455 and his wife Rebecca Mocatta had 14 surviving children (but see note 1 below) and thus made a big contribution to the influx of Barrow and Lousada relatives to Australia. This image was taken from ref 282. Before his arrival in New South Wales, he petitioned for 5000 acres - double the normal grant. The local Governor needed assent from London which was duly given. The land was in various parcels but principally in Bligh, Wellington and Bathurst. An account of this negotiation is given in ref 77. Nanima station is shown here, near Wellington - just northwest of which is the small town of Montefiores. Esther Hannah Barrow Montefiore 1829-83 #588 was the 2nd daughter of Joseph Barrow Montefiore. She was born at sea (see note 1 below) and died in Woollahra. She married her cousin Eliezer Levi Montefiore in Adelaide on 3 May 1848. They had 1 surviving son Arthur Augustus. This portrait was drawn by Eliezer (and comes from ref 281). He went on to acquire further land in New South Wales through his company J Barrow Montefiore & Co. and by 1838 owned 12,502 acres. His land-holdings were dwarfed by the holdings achieved by his nephew Jacob Levi Montefiore #609, who started his Australian business career with his uncle's company in Sydney. A biography of his nephew Jacob from ref 53 is included under the nephew's name in our main genealogy. He bought city blocks in Melbourne in 1840, one of which on the corner of Spring and Flinders Streets (ref 78) and is now occupied by Shell House! His grave is at Balls Pond Road Jewish Cemetery at Islington and clearly shows his Barbados origin and reads 'In memory of Joseph Barrow Montefiore born in the Island of Barbados the 24th June 1803 died on the 4th September 1893 Ellul 23 5653'. A biography from ref 53 is included under his name in our main genealogy. Joseph Barrow Montefiore arrived in Sydney in 1829 (see note 3 below). His London brother Jacob Barrow Montefiore was a partner in J Barrow Montefiore & Co., and in 1834 the 2 brothers appeared in an advertisement announcing the prospectus for the formation of the Bank of Australasia - a predecessor of the ANZ Bank - with Joseph as local representative and Jacob as a founding Director. Joseph's association with the bank did not last long (see note 4 below). Joseph Barrow Montefiore also had a partnership with David Ribiero Furtado who came to Australia with him (see note 5 below). In 1837 his nephew Jacob Levi Montefiore joined him in Sydney, but then started trading on his own account (see note 13 below). Joseph appeared in Melbourne very soon after its establishment from Tasmania in late 1834 where he rented the house of John Batman, founder of Melbourne, and bought city blocks (see above). He over-extended himself and his company went bankrupt around 1841 (see note 8 below). He returned to England for a period (see note 9 below), and on his return to Australia he went to the new colony of South Australia in 1846 (see note 10). In Adelaide (see note 11) Joseph with others founded the Adelaide Marine Insurance Company and the railway linking Adelaide with Port Adelaide; he was also involved in copper and gold mining at Montacute (see note 2 below). 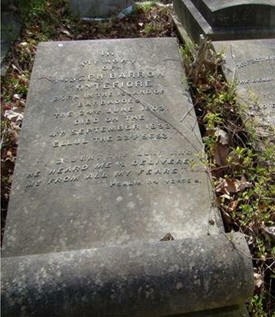 His nephew Eliezer Levi Montefiore (a brother of the Jacob Levi Montefiore referred to above) preceded him in Adelaide. Joseph became a partner in his nephew's business (see note 7 below) and Eliezer married Joseph's daughter Esther Hannah (see portrait above). The house of Joseph Barrow Montefiore was in Palmer Place, North Adelaide; as can be seen it underwent two substantial changes. The house was on Montefiore Hill in North Adelaide (this hill on the fringe of the City of Adelaide was named after his brother Jacob) quite close to the Light's Vision monument. We have also located the Adelaide premises of J Barrow Montefiore & Co on the corner of King Willliam Street and Grenfell Street in the city. This site was established by his nephew Eliezer Levi Montefiore. 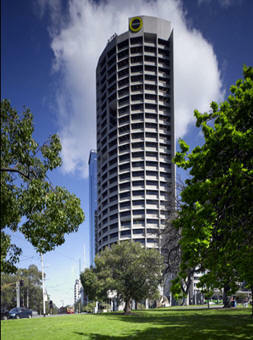 The site was subsequently occupied by the Imperial Hotel and then by Westpac. All that remains of this now is Imperial Lane running to the east of the Westpac building! Despite his very active business life the estate of Joseph Barrow Montefiore was relatively modest, as newspaper accounts showed (see note 6 below). 1. A 15th child - a son - was born in 1850 with unknown lifespan. But though ref 282 tells us that Joseph had a further child - a son Leslie 1830-1909 who appeared in Melbourne in 1851, a son with an 1830 birthdate was impossible. There is no suitable gap in the ages of the first 5 children of Joseph and Rebecca unless Leslie was a twin. Australian newspaper reports rule out him being a twin of Esther Hannah (see note 3), Emily, Sarah or Justina as these reports each refer only to a daughter born in 1829, 1830, 1832 and 1834 respectively, while he was not the twin of the 1st daughter Judith either for ref 53 informs us that on arrival in Sydney in 1829 Joseph and Rebecca had 2 children. One was Esther Hannah born just before arrival so Judith Georgiana #587 must already have been born (as the 1st daughter named after the paternal grandmother) confirmed by ref 170 ptIp1 which informs us she was born in London on 16 Oct 1827 (with no twin). Clearly ref 282 has got something wrong here, and the author himself gives a clue as to what this is in ref 285, for there an order by Jacob Montefiore is attributed to Joseph! As the lifespan attributed to Leslie is actually that of Eliezer Jacob Montefiore #1921 the first son of Jacob Barrow Montefiore, and because it is hard to see how the 18th Dec 1851 letter in its referral to Leslie as a son could have been misread, we conclude that the 18 Dec 1851 letter in ref 282 was written by Jacob and not Joseph (admittedly not an easy conclusion to draw - see note 12). 2. These details are from Valerie S Hicks 'Osmond Gilles: The Colonial Treasurer' self-published 1985. 3. A Sydney newspaper report of 26 Feb 1829 shows his 2nd daughter Esther Hannah was born at sea on the Jupiter on 1 Feb 1829. 4. The insolvency of E L Montefiore & Co., in which he was a partner, brought him into legal conflict with the bank which pursued him in Adelaide in 1853 (see Adelaide Observer 30 Apr 1853 - which gave court transcript excerpts including a description of his large housing expenses, his wife's income of £355pa from 'settled property', and payments to Jacob Montefiore). See also note 11 for another element in his relations with the Bank. 5. This partnership dissolved in 1837 and was replaced by Montefiore Breillat & Co in Sydney and Montefiore Furtado & Co in Hobart Town (ref 79). 6. On 16 Dec 1893 p8 The Australian Star reported the value of his residuary estate to be divided between his daughters Evelina, Augusta, Helen and Marion was £1244 7s 10d. 7. This ended in insolvency in 1852 as shown in the Adelaide Observer of 20 Mar 1852 with formalities still going on late in the year. He attributed his neglect of other duties to the needs of the business after his nephew left Adelaide. 8. The bankruptcy was slow to resolve - both Jacob and Joseph appeared in official bankruptcy notices in England in 1844. 9. His children Josephina (in 1837), Herbert (in 1839), Marion (in 1842), Horace (in 1843) and Edith (in 1845) were born in England. 10. Joseph arrived on 27 July 1846 on the Medway, with wife and 11 children (from Judith to Edith), as reported in the South Australian Gazette and Colonial Register 1 Aug 1846 p2. During his stay in England he became a provisional Director of the Australian Mining Company and his address was 2 Winchester Buildings, Great Winchester Street - from the South Australian 28 Nov 1845. 11. He had a turbulent life at this stage. An account on 11 Mar 1852 in the South Australian Gazette and Mining Journal describes a heated physical encounter between Joseph Barrow Montefiore and an officer of the Bank of Australasia. 12. An apparent difficulty lies in the fact that the 1st son of the Joseph/Rebecca marriage was Herbert born 10 Apr 1839, and this name is a much poorer reflection of 'Eliezer' than 'Leslie' is; we could expect that Joseph's 1st son would have been named after the paternal grandfather just as Jacob's was - but it is possible that Joseph's adherence to the strict naming customs of Judaism may have waned by the time Herbert was born. The example of Herbert George Lousada b1847 #206 springs to mind - his paternal grandfather was Moses. No hint of any other possible first son of Joseph can be found, and this eased the difficulty in drawing our conclusion, while Leslie not being Joseph's first son means a further mystery did not arise - ie where was Jacob's first son? 13. The Australian of 10 Oct 1837 shows that a Jacob Montefiore arrived on the Lord William Bentinck on 8 Oct. This was Jacob Levi Montefiore (according to ref 53), Joseph's nephew ie not Joseph's brother Jacob. The nephew went on to become a vastly more successful and influential businessman than his uncles Joseph and Jacob Barrow Montefiore and brother Eliezer Levi Montefiore. He became a close associate of Henry Parkes (later the 'father' of Australian federation), and a vast landholder through his businesses starting with Montefiore, Graham & Co. (which was dissolved in 1861), then subsequent businesses, and with his last business being Montefiore, Joseph & Co. He lived in Birchgrove before returning to England late in life. His artistic interests were an inverse reflection of those of his brother Eliezer, and his marriage was apparently childless.